The first time I visited the salt flats of Trapani, Sicily, I marveled at how they stretched into the Mediterranean, their narrow dikes holding back the sea. I was exploring this part of Sicily where my father’s parents were born, and the flats were a regional attraction. Amazingly, they still produced salt, probably in much the same way as they had in my grandparents’ time. In the spring, water is pumped into the flats. The summer sun and winds evaporate the water until crystals form. Starting in July, burly men tanned as dark as leather break up the crystals, shoveling them into white mountains that glint in the bright, hot sun under an impossibly blue sky. Windmills, which once pumped seawater and ground the salt crystals, still stand. They were likely of Turkish design, built when Sicily was under Spanish rule, around 1500 CE. The Phoenicians may have built the flats long before, to cure their fish. No one knows for sure; history is never simple for an island that’s been conquered over the centuries by Greeks, Arabs, Normans, and others. Yet I try to unravel it as best I can. When my grandparents (whom I never knew) left Sicily for Canada in the early 1900s, they severed all ties. My oldest aunt remembers my grandmother saying Sicily was horrible. There were crop failures, excessive taxation … why would they ever return? But I’ve learned our Sicilian family tree goes back to the 17th century, when the Genovas moved to the hillside town of Vita, in 1604. Maybe they never actually made the 30-kilometer, all-day trek by donkey cart to the flats, but there’s no doubt Trapani salt flavored their meals and preserved their foods. Standing on the deck of a restored windmill, I finally felt a visceral connection with my family’s roots. I carried the connection home in large chunks of salt crystals, as valuable to me as any jewels. They sit on my kitchen counter, waiting to be crushed and sprinkled onto my salad greens, a constant reminder of my heritage. 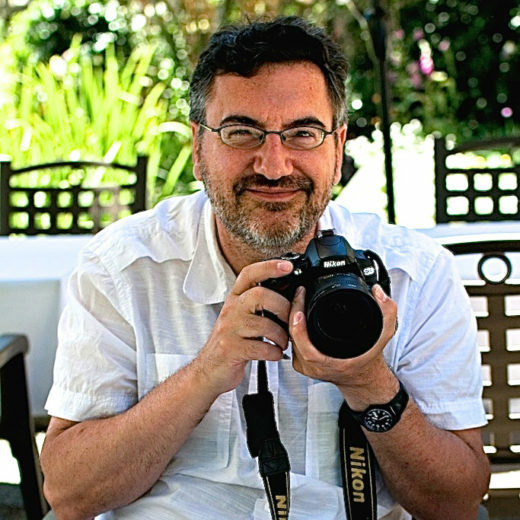 Don Genova is a freelance food and travel journalist based on Vancouver Island. He’s produced many radio columns about food for CBC Radio. He teaches courses in food and travel writing at the University of British Columbia and shares his Italian heritage through cooking classes at Kilrenny Farm in Cowichan Bay. Photo by Stephen Hawkins. Cite this Article: Don Genova “The Salt Flats of Trapani,” Hakai Magazine, Apr 29, 2015, accessed April 23rd, 2019, https://www.hakaimagazine.com/article-short/salt-flats-trapani/. Only a handful of salt makers in Goa, India, keep a 1,500-year-old tradition alive. What will happen when they throw down their rakes?